Schedules: Too tight, unrealistic, and overly optimistic. Planning: Based on insufficient data, missing items, insufficient details, and poor estimates. 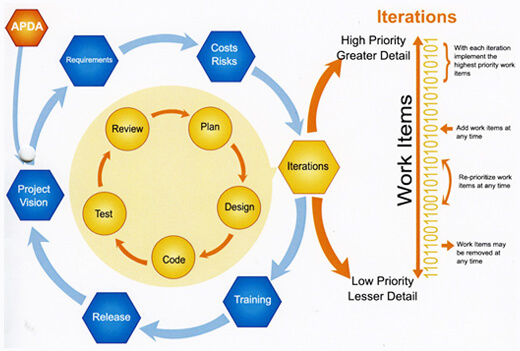 The graph below demonstrates how SunNet’s project management methodology, APDA, which is based on Agile Software Development can help reduce your custom project’s developmental failure risk. For over 11 years, SunNet has incorporated APDA on over 100 custom projects. Cost Control- APDA allows for measurable timescales and evolving requirements which enables fixed budget per iteration- meaning the scope of the product and its features are the variables, rather than the cost. Product Quality- APDA uses iterations with testing integrated throughout the lifecycle enabling regular verification of the working product as it is developed, with regular releases. Through client collaboration ensuring that expectations are met, product quality is a given. Risk Management- APDA development helps identify issues early, making it easier to respond to change. The flexibility of APDA anticipates changes as requirements emerge and through prioritization keeps the project on target. Because APDA allows for requirements to emerge and evolve, the emphasis stays on building the right product for the customer. Customer Satisfaction- During the kick-off meeting, we make it a priority to understand your business to ensure our system architect and mockup designs are in line with your business process. During the coding, we hold weekly user acceptance reviews and testing to ensure we are on the right track. Bi-weekly customer meetings are also held throughout the course of your project to ensure your satisfaction.